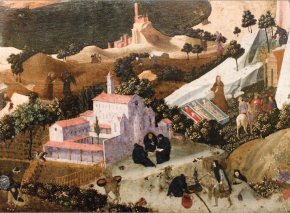 The Musée Thomas-Henry which was attempting to acquire the panel by Fra Angelico auctioned off last Saturday in Marseille by SVV Leclère (see news item of 6/9/12) failed to purchase the work. The painting fragment in fact sold for 445,000€ (552,000€ including charges) and could therefore not be pre-empted. We can in no way blame the museum for not succeeding - it did indeed manage to raise 430,000€  - although we do regret the consequences for French heritage. However, this may not be altogether a lost opportunity since the the work was wrested by a French collector from the international art market. The painting will thus remain in France and there is still a chance that it will one day end up in a French museum, purchased either by Cherbourg (which owns another fragment of this same panel) if it finds the needed sum, or else if it is donated through "Acceptance in lieu" - why not - to the State which will then place it on deposit in this Normandy museum or even - this happens frequently - if its bequeathed or donated by the owner to a French public collection. In any case, it is obvious that its conservation in our country holds promise for the future. There is no doubt that had it left France there would be slim chance of it ever joining our cultural heritage again. This is only one of the reasons why we hope that the French wealth tax is never applied to art works. If it had been in effect when Michel Laclotte identified the author of the panel, the owner would have probably refused to see it published knowing that it would mark him out for the tax authorities and oblige him to pay a tax on it every year just for the right of keeping it. Unpublished, the work could leave France without any problem for sale abroad or have changed hands discreetly, certainly not at auction where it could run the risk of being publicized. It would also be naive to think that the potential buyer would have been French or even resided in France. Although this is definitely a loss for French museums, it is only temporary ; that is, as long as the ISF, this lethal arm for our cultural heritage, never goes into effect. The directors of our major museums understood this perfectly when they signed the open letter to the Minister of Culture (see article in French). Is it so hard for the Parliamentarians to understand once and for all instead of raising the same spectre every year ? 200,000 were contributed by the city (an exceptional budget was voted for the occasion), 200,000 by the Fonds du patrimoine and 30,000 by the Amis des Musées. Next article in Editorial : I, the President of the French Republic, Will Appoint Martine Aubry as Head of the Louvre !